Happy August Everyone!! Hope you like this week's "Gift Idea For The Book Lover"! Scroll down below and check out this week's items and let me know which is your favorite? 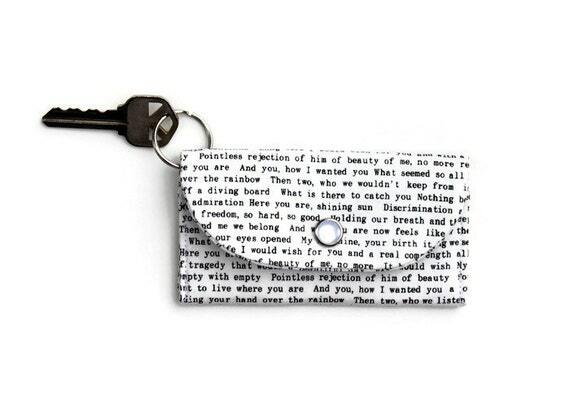 This keychain wallet is for all the book readers and literary lovers. A perfect student ID card holder and dorm room key ring for the English majors. Your cards and keys go together with plenty of space for credit cards, ID cards and money. The eyelet and ring allows you to attach your key to the case. This wallet is made with fun white and black fabric with book text throughout. The interior divider allows for separation of cards and money for a little organization. The snap secures your contents. The size is approximately 4 1/2 inches wide and 2 1/2 inches tall, or 11.5 cm x 6.5 cm. This listing is for an 8" by 12" wood burned signed. 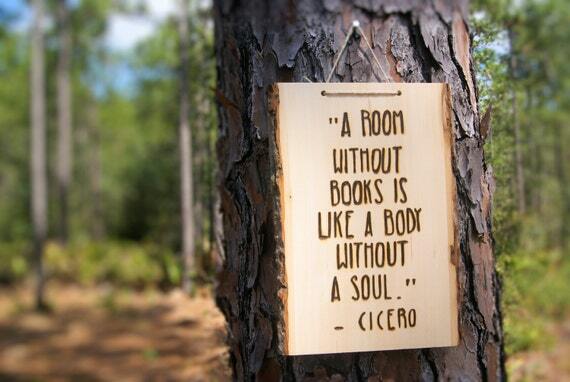 The basswood sign has been woodburned by hand to say "A Room Without Books Is Like A Body Without A Soul." - Cicero. The wood has two holes with twine running through to make the piece easy for hanging. The piece can also be made using a sawtooth hanger in back instead of the holes and twine. Each piece is custom made so the piece (and piece size) may vary from the picture above. Please allow up to one week for the piece to be created before it is shipped. Every piece made by Woodland Heart Decor is handmade. Each piece is created to make your walls more warm and welcoming with a rustic edge. These pieces can be used to make a gallery wall more complete or as a stand alone unique piece of art. We have featured our pieces in people's homes and weddings. This would make a great gift for a book lover or bibliophile. The sign would be perfect in a home library or living room. Any book worm would love to have this piece featured near their bookshelf full of favorites. 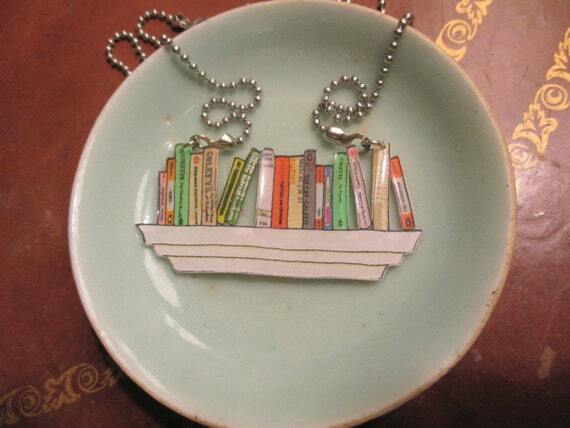 A 'shelf portrait' necklace is a realistic depiction of your most-loved books. Choose up to 17 books to go on your new favorite necklace! Your necklace will be hand-drawn and hand-colored to represent the books you choose. Please be aware that there are some limitations with this form; certain details can be difficult to render, and white or metallic lettering can be problematic. Each shelf is made of durable, lightweight shrink-plastic, hand-cut and sealed. The chain is American-made stainless steel ball chain with stainless steel lobster-claw clasp and fittings. Shelf measures approximately 1 3/8" high x 2 6/8" wide x 1/8" thick. Chain is approx. 20.5" long, including fittings. All of my pieces are made from my original drawings; each one is unique. 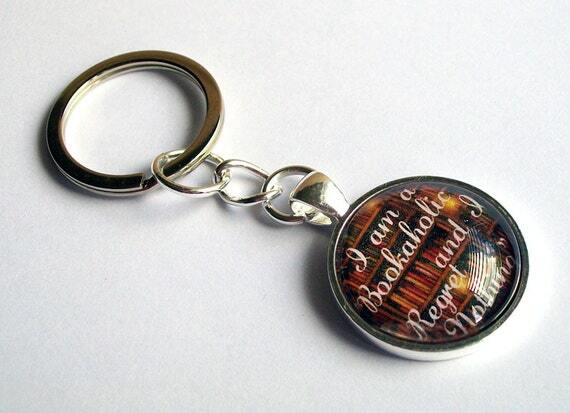 Bookaholic keyring / bag charm with Glass Dome. This is a beautiful keyring that features the quote "I am a bookaholic and I regret nothing" with a book shelf back ground. This keyring is a silver plated pendant and a glass dome which magnifies the image beautifully. The pendant is 28mm (approx.) and hangs perfectly on the strong split ring or swivel clasp. This keyring comes with an organza gift bag. If you have any further questions feel free to convo me!